Burning Point is a Finnish heavy metal / power metal band that has been around since 1999. They play oldschool straight-forward power metal to the likes of Stratovarius, Hammerfall and Gamma Ray. The Ignitor is their fifth studio album, their last album Empyre came out in 2009. I never heard of these guys, but I have to say, I listen to so many different genres that I might miss a few. 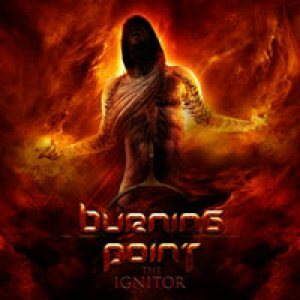 After a first hearing of this album, Burning Point feels to me like a one-in-a-million power metal bands. After a second, and third, and even fourth, I start to like this album more and more. It’s easy to listen to, the songs all have the same vibe, the choruses are easy to sing along too. One of the best things about Burning Point is probably singer Pete Ahonen, who instead of constant high screams (like you hear often with power metal bands) creates nice mid-range vocal lines. He has plenty of moments to show what his full range can be, and that he can easily hit those high notes, but personally I like the lower vocal lines more. This album isn’t bad. It’s not bad at all! I actually quite like it. But, since it sounds so generic, there’s really not much to say about it. In the Night is a bit darker than the songs mentioned before, but has a great sing-a-long chorus to make up for that. The Ignitor is the titlesong for the album, and is an epic power metal classic. The riff reminds me of Dream Evils’ Book of Heavy Metal (which is a true classic). Silent Scream is the bands’ power ballad (yuck) but it’s well executed, exactly as it should sound. Thank god for Heaven is Hell, which makes us forget about Silent Screams right away. With Losing Sleep the band takes a step away from the standard power formula with an interesting mainriff and some breaks. But when you get to the chorus they’re back to the how-it-should-sound formula already. Everdream is the only song in which Pete actually screams. Just another straightforward song to headbang along too. Not much to say about the other songs really, except that Lost Tribe is imo the weakest song on the album. The last song, however, could also be one of my favorites 😉 *Hums along* Holier than Thou! The only let-down I can find about this album, are the keys. I feel the keys are a bit too much (since most of the time they play exactly the same as the guitars) but maybe it makes for a fuller, more complete sound. It’s not needed for the songs though, so I’d leave them out. Hammerfall has been around way longer, but Burning Point sounds like Hammerfall should. If you’re into power metal, this is an album you can’t miss. There’s no real highlight, but it’s a constant flow of happiness. A fun-loving metalhead from the Netherlands. Not much to say really. I like listening to or playing metal, I totally love being creative (either in music or with a wide variety of materials). Nothing always for the best though. Anyway, any questions? Just ask! Posted on July 25, 2012, in Heavy, Power. Bookmark the permalink. 1 Comment.